No, it's not a ladder. Our collection of pre-recorded movies had been stored in the shelves and cabinet of our tv cabinet in layers three-deep. This is not conducive to easily picking out a film to watch. I designed this bookcase to hold video tapes and DVDs and to fit in a space available in our home theatre room. 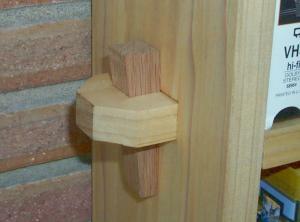 The case is held together with tusk tenons at the ends of the top, bottom, and middle shelves. The other shelves rest on simple brackets which are screwed to the side pieces. I thought about using sliding dovetails for these shelves, but then I remembered that I actually wanted to finish this project in finite time. By removing the wedges from the tenoned shelves, the whole case can be broken down to be just a stack of boards. The shelf is made from 6-inch poplar boards from the Borg (Home Despot). The 5-1/2 inch actual width is just right for those big boxes Disney insists on putting their movies in. I used poplar mostly because I'm cheap, but Becky and I both like the interesting color and grain it has. I made the wedges from some red oak I had lying around. I tried fuming it with some household ammonia, and it did actually turn a very light chocolatey brown, but not so you'd notice without holding an unfumed piece right next to it. Maybe you have to use white oak to get good results with fuming... As narrow as it is, this shelf is obviously not meant to stand alone. I bolted it to the wall with a couple of angle brackets. As usual, no power tools were used in the construction of this piece of furniture. The finish is Watco natural directly over the hand-planed surface. No sanding.